This crape is a CATAWBA (PURPLE) its autumn foliage prepares to take center stage. Catawba Crape Myrtle’s leaves will yield gorgeous shades of reddish-bronze, orange and yellow. This vivacious presentation will add endless splashes of color to your fall garden. 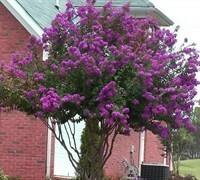 Catawba Crape Myrtle reaches heights of 12-15 feet at maturity.